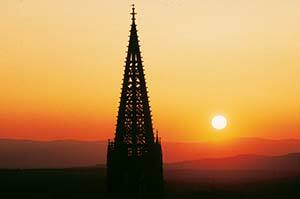 ABOVE: The sun sets behind the Münster (Freiburg Cathedral). INSET BELOW: A Freiburg manhole cover, a child wades in the medieval Bächle that run through the Altstadt, and hikers explore Schauinsland just outside of town. Freiburg im Breisgau is a lively, prosperous university town of about 200,000 at the western edge of the Black Forest, on the main rail line between Frankfurt am Main and Basel, Switzerland. Freiburg is said to be the sunniest city in Germany, and it also has a reputation for being one of the most people-friendly: We made our first trip to Freiburg (with children in tow) in the 1980s after it earned Germany's #1 livability rating in Eltern, a German parenting magazine. If you like walking, you'll love Freiburg: The city began banning cars from its shopping district in 1949, and the center of town was repaved with stone and turned into a pedestrian zone in 1973. Freiburg's unique Bächle, the 13th Century water channels that had been paved over in the automotive era, were reopened, and today you can take off your shoes and cool your feet in fresh water from the nearby mountains when you need a break from sightseeing. Best of all, Freiburg im Breisgau isn't just a tourist destination: It's also your most convenient gateway to the Black Forest, which begins literally just across the street from the pedestrian zone. From Freiburg, you can easily reach villages and hiking paths in the Hochschwarzwald and other nearby scenic areas by train, bus, or car. I'd recommend spending at least three days in Freiburg, or--better yet--a week if you can spare enough time to enjoy both the city and its rural surroundings. Top and bottom photos copyright © FWTM.